These simple gentle exercises can help the proteins in lymph fluid to be reabsorbed, and your arm lymphedema symptoms to diminish or disappear. Be sure to discuss your exercise plans with your doctor—before you start. Your doctor may also refer you to a physical therapist who can help you learn these exercises, and teach you others as well. If you have recently had surgery, wait until your surgical drains and sutures are out before trying these exercises. Do these exercises gently—you’re not bodybuilding here—and do not exercise to the point of pain. Always wear your compression sleeve on your affected arm while exercising. Stop exercising if your arm begins to swell or turn red. Dress in loose, comfortable clothing—style is not important for these exercises. Warm your affected arm and hand before starting to exercise—take a shower, tub soak, or use a warm compress for about 20 minutes. Be regular about doing your arm lymphedema exercises. This will aid your recovery and give you the best results. Ready? Let’s start with some seated exercises. The ball squeeze exercise is done while you are seated and is a good way to gradually work into your other exercises. You can do the ball squeeze exercise with your surgery-side arm, as well as with your unaffected arm. Use a flexible ball that is a bit larger than your palm. Your exercise ball should not be heavy and should offer some resistance to your grip. The proper ball will spring back into shape when you release it but will require some pressure to squeeze it. You will feel muscles in your fingers, lower and upper arm working as you do the ball squeeze. This muscle movement should help move excess lymph fluid back into circulation and help you avoid swelling. Remember: Always wear your compression sleeve on your affected arm during exercise. Sit or stand with good posture—keep your back and neck straight and your shoulders relaxed. Grasp your exercise ball lightly between your palm and fingers. Extend your arm in front of you, holding your arm higher than your heart. 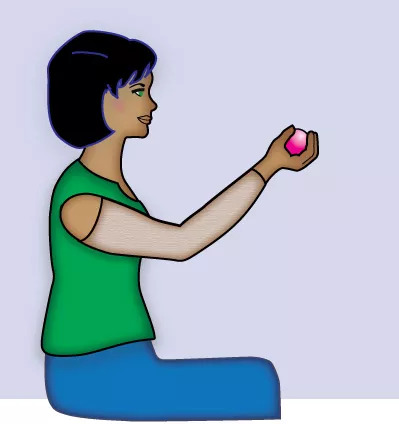 While keeping your arm elevated, squeeze the ball with your fingers as tightly as you can. Hold the squeeze for about 3 seconds, then release.